The US growth figures were discussed in a post on this blog yesterday. The focus in this post will be on the UK numbers, and in particular the path followed by the UK in the downturn that was sparked by the US financial collapse in 2008, in the last year of the Bush administration. Comparison to the path followed in the US economy is especially interesting as both countries have followed similar aggressive monetary policies (with independent Central Banks pushing short term interest rates essentially to zero, plus the use of quantitative easing to provide ample liquidity to the economy), both have independent floating currencies (unlike the economies tied together with a common currency in the Eurozone), and both moved aggressively at the onset of the crisis to keep large banks from failing through official loans which were later repaid. But there is one important difference, and this sets up a natural experiment which is rarely possible in economics. Following elections in May 2010, a Conservative Party led government in the UK (in coalition with the Liberal Democrats as a minority partner) moved to an aggressive austerity focused fiscal policy, with major cut-backs in government spending. With other policy factors being similar, one can see what the impact of such a fiscal austerity program will be, not only in comparison to what was happening immediately before in the UK, but also in comparison to a US economy which was otherwise following similar policies. In the UK parliamentary system, the fiscal austerity program was passed via an Emergency Budget in late June 2010. Such a dramatic change in policy is possible in a parliamentary system as the ruling government will always enjoy a majority in Parliament (perhaps in coalition with other parties), so Parliament will not hold up the program of the government as it can in the US congressional system. Indeed, in the US now a minority of 40% of Senators will veto any measure they wish due to abuse of Senate rules (rules which are not reflected in any way in the US Constitution, which does not call for a super-majority of 60% to pass such measures). These Senate rules have been in place for a century and a half, but until recently were used only in rare exceptional circumstances. This use of these Senate rules have blocked Obama from implementing many, although not all, of the programs he has sought. 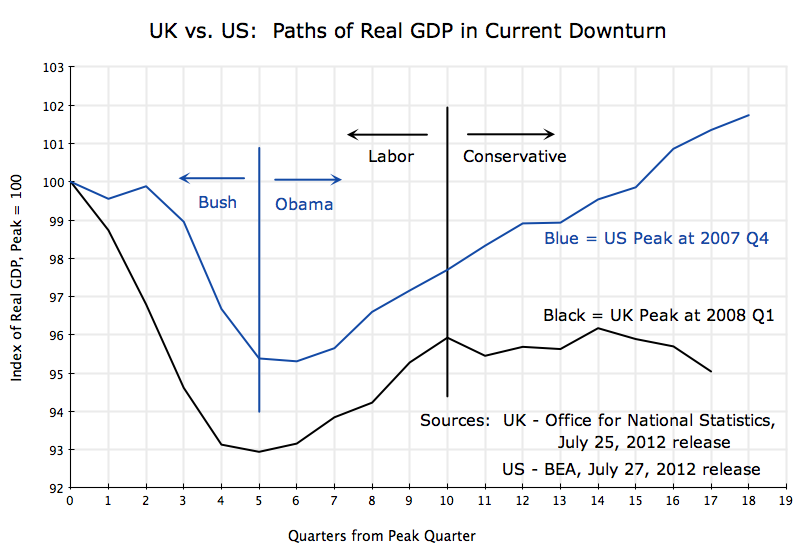 The graph above shows the path of GDP growth in the UK and in the US by calendar quarters from the pre-recession peaks in GDP (set equal to 100). This peak was in the fourth quarter of 2007 for the US, and in the first quarter of 2008 for the UK. The downturn started in the US. The UK economy then dropped further and faster, as the financial sector was at the center of the collapse and the financial sector (with London as the most important international center) is a larger share of the UK economy than it is in the larger and more diversified US economy. The US economy began to recover soon after Obama was elected and was able to pass and start to implement the fiscal stimulus package (along with aggressive measures by the US Fed and other actions). The UK economy also began to turn around at about the same time. The Labor Party Government under Gordon Brown was following similar measures as were being implemented under Obama in the US. Both economies then began to grow, at roughly similar rates. But then the UK held the May 2010 elections, which the Labor Party lost. The Conservatives (in coalition with the Liberal Democrats) took control of the Parliament and of the government. David Cameron became Prime Minister. He immediately announced that an aggressive austerity budget would be drawn up and implemented, and it was, starting in the summer of 2010. This was the tenth quarter from the pre-recession peak for the UK of the first quarter of 2008. The impact has been clear and stark, as shown in the diagram above. The economy reached a peak in its recovery in the tenth quarter, but then the recovery stopped. The UK economy has now fallen for three straight quarters, going into a double-dip recession. The US economy, in contrast, has continued to grow. The UK fiscal austerity package has clearly been a failure. The economy stopped growing when that program began. The Conservative Party argument in favor of their austerity package was that it would induce “confidence” among investors, and that their increased investment would off-set the cut-backs in government. This has not happened, despite ample liquidity in the markets and interest rates that are at historical lows. The alternative view, which I share, is that investors will invest to expand capacity only if they see a market for what they would then be able to produce, and only if they do not have an existing excess of capacity to produce it without further investment. Fiscal austerity will reduce that market, not expand it. To argue that contractionary fiscal policies will be expansionary is just wrong and is inconsistent with the facts. Contractionary policies are contractionary. The austerity program has also failed in its announced aim of rapidly bringing down the fiscal deficit at a faster pace than was forecast before. With the economy flattening out and then declining, tax revenues have fallen below what was anticipated. After close to a year and a half of experience under their fiscal austerity program, the Conservative Government had to admit last November that their plan to bring down the budget deficit to zero would require two more years than they had originally said. Since then the economy has deteriorated even further, with GDP falling for three calendar quarters now rather than merely remaining flat. The date by which their avowed aim of budget balance will be achieved will have receded even further. The austerity program has failed even by its own objective of seeking to bring down the deficit rapidly. These results are important for the US. Mitt Romney and the Republican Party in the US have argued for a fiscal austerity program similar in nature to what the Conservative Party is implementing in the UK. But the UK results have been abysmal. Even business leaders gathered in London for meetings surrounding the Olympics now underway, have called for David Cameron and his Conservative Party to reconsider his fiscal program, according to a report in today’s Financial Times. The Cameron Government has argued that the 2.8% decline in GDP in the second quarter was in part a consequence of special factors (the celebration of the Queen’s Diamond Jubilee and unusually wet weather; but celebrations normally spark growth, and one would have thought that the UK knows how to cope with wet weather). It also may well be the case that the Olympic Games now underway in London will lead to growth in the third quarter due to high tourist and other expenditures linked to the games. But even discounting such special factors, one cannot hide the abrupt flattening out and then decline in the economy since the fiscal austerity program was initiated. The contrast to the US path is stark. Finally, it is of interest to compare the 2008 downturn and aborted recovery in the UK to the path the UK economy followed in the 1930s, during the world-wide Great Depression. As seen in the graph below, the UK path is now well below where it was at the same point during the recovery from the 1930 downturn. 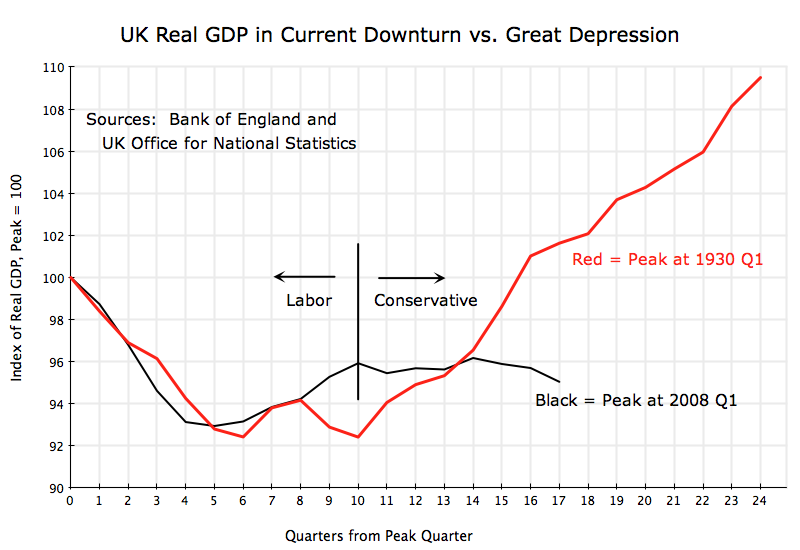 Economic performance in the UK is worse now than it was during the Great Depression. The record of the austerity program in the UK, a program that the Repubicans want to duplicate in the US, has been truly terrible. This entry was posted in The Economic Crisis and tagged austerity, economic growth, GDP, policy by aneconomicsense. Bookmark the permalink.